On a previous page we have covered Card Inserts for a standard sized card, but sometimes you may want to make a card with something a little different. But it still needs to be finished off neatly, and you may want somewhere to add a special sentiment or a meaningful verse. It is relatively easy if you just want to add separate small panels to each of the folds, and this is can be a really good way to add in that little verse. But another way is to add an insert to the back fold in the card. 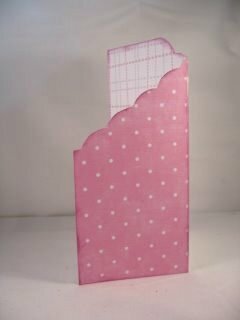 Then with some wet glue or a string double sided tape I have attached it to the inside of the card. Just run a strip of the glue or your tape along the inside edge of the paper and attach it to the inside front of your card. Now when the card is opened the insert will open too. 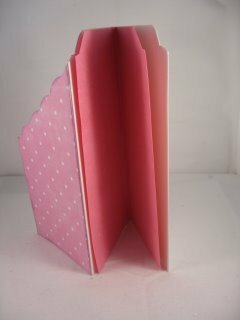 I have shaped the top of the Tri-fold Card insert to blend in with the back panel and added some flat backed pearls to it as well. 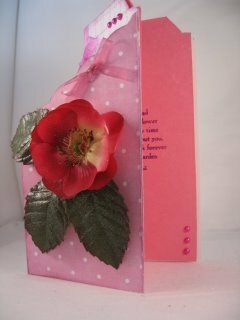 Now the card has a verse that will please the recipient and the card itself has a more professional finish to it. Return from Tri-fold Card Inserts to Homepage.